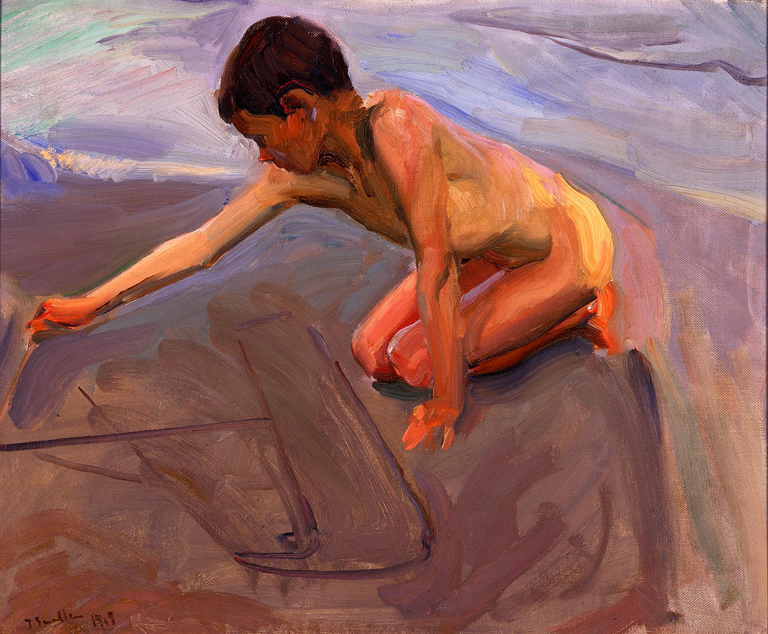 A young boy kneels at the beach, drawing a sailboat into the wet sand with a stick. The sun beats on his bare skin and makes him almost glow with warmth and light. Behind him, water licks at his feet, cool and tempting. Although he is intent on his project, we know that once he has gotten too hot, he will lose interest and go back into the water. Now that’s it September, I thought we’d have one more taste of summer by exploring Drawing in the Sand by Joaquin Sorolla y Bastida (Spanish, 1863-1923), which is on view in Gallery 11. Born and raised in Spain, Sorolla’s artistic talent was discovered early. While still in his teens, he visited the Museo del Prado in Madrid and found much to admire in the old masters of Spain: in particular, he was fascinated by Diego Veláquez’s treatment of light and José de Ribera’s vigorous brushstrokes. After studying in Rome and Paris, he returned to Madrid in 1890 and soon became well-known in well-to-do social circles. Although he painted portraits of royalty and the upper class, he used every artwork as a way to explore the problem of light. Sorolla became internationally known after he exhibited at the Exposition Universelle in Paris in 1900. At this point he found true success–and satisfaction–by combining his exploration of light and plein-air technique in his beach scenes. A few great examples can be found in the Metropolitan Museum of Art, the Hispanic Society of America, the Sorolla Museum, and the Prado. Although sometimes associated with the Impressionist and Symbolists who painted at the same time, Sorolla remained independent of a specific art movement. At the same time, he created some of the most modern paintings of the early 20th century. A 1909 solo show in New York featured 356 of his paintings and introduced him to an American audience. Touted as “the Spanish painter of sunlight and color” by the New York Times, 169,000 visitors attended the show in about a month. He was soon given a commission for a series of murals celebrating traditional life in Spain for the Hispanic Society of America, which he painted between 1911 and 1919. Milwaukee was at the forefront of Sorolla’s popularity in America. Drawing in the Sand was a gift to the Milwaukee Art Institute in 1911 from its early president, Samuel O. Buckner. Just think of it as the contemporary art of its time! After returning from his US tour, Sorolla built a home in Madrid (now a museum). He spent the rest of his life capturing on canvas the bright light in both his gardens at home and the dramatic scenery of Spain. Sorolla’s sparkling canvases make me feel like I need to squint against the glare. The luscious use of paint seems to flow across the canvas even when dry. There is a lack of detail that can be associated to the abstraction of the period; he used areas of color rather than shading to depict volumes. To me, the simplicity of the compositions is just what the summer is all about. The sun so is bright that it blurs everything before your eyes, evoking other senses like feel, smell, and taste. Although Drawing in the Sand seems like a modest painting, I like to think that the artist was referring to himself in the narrative. Just as Sorolla first discovered his love of art on the Valencia coast, so does this little boy find artistic inspiration in the beach. From modest beginnings can come greatness. So, as the weather cools, take a moment to remember the summer with a look at Drawing in the Sand in the galleries. It may just help you get through the winter to come! This entry was posted in Art, Curatorial and tagged 20th century art, From the Collection, joaquin sorolla y bastida, sorolla, spanish art. Bookmark the permalink.